SACE is a governance project funded by USAID to support civil society to advocate for reforms that improve transparency and accountability and increase inclusive governance in Nigeria. It was now very apparent why the likes of Oludotun Babayemi, co-Founder of Connected Development , Omojuwa; Social Media Commentator, Maryam Uwais; Human Rights Lawyer and Activist were representatives of their respective organizations to share thoughts with the group of CSOs present at the event. Japheth Omojuwa, a Nigerian blogger, public speaker, socio-economic and political commentator and social media expert gave doses of advice for Social Media folks. He said “One of the fastest ways of reaching people is perhaps through Social Media” but, a caveat was labelled on to that “We have to take responsibility for the platforms we consume our news from”. The 2016 Best Twitter Personality Of The Year said part of what drives our movement towards achieving success with Social Media is that, “the citizens now have the power to drive change via new media but because we are now in the era of masses; Mass media, mass production, mass movement, we have move from the stage where organizations say something and we follow”. Oludotun Babayemi, shared essential information on how Connected Development’s FollowTheMoney – the largest grassroots movement was designed to track and visualize government funds in Africa . He said “Passion drove us to Zamfara State to link what was happening but we never thought of sustainability; however sustainability is an essential component of building effective public campaign strategy.” Speaking more on how passion drove their activity, he said “the first time we journeyed into Zamfara State, Bagega wasn’t even on Google map“. He also intensively debated that “No country has been able to move from underdevelopment to development without Education”. The Stanford University Centre for Development, Democracy and the Rule of Law fellow enthused further that “We decided not to be conventional in our campaign but to leverage heavily on the media, both traditional and the new, in innovative ways. We started Follow The Money campaign by tracking government funding on health, education and environment and we constantly leveraged on champions to drive the Bagega Campaign such as Omojuwa as key influencer, as it is always sane and reasonable for long-term sake that “NGOs should focus on their strengths and have one thematic area of work to remain relevant and in sync with the public because originality, people and technology are key to success”. Babayemi advised that “evidence based advocacy is important in having focused campaign” to be able to have strengthened public awareness, discourse and support for key democratic governance issues such as transparency, accountability and good governance. 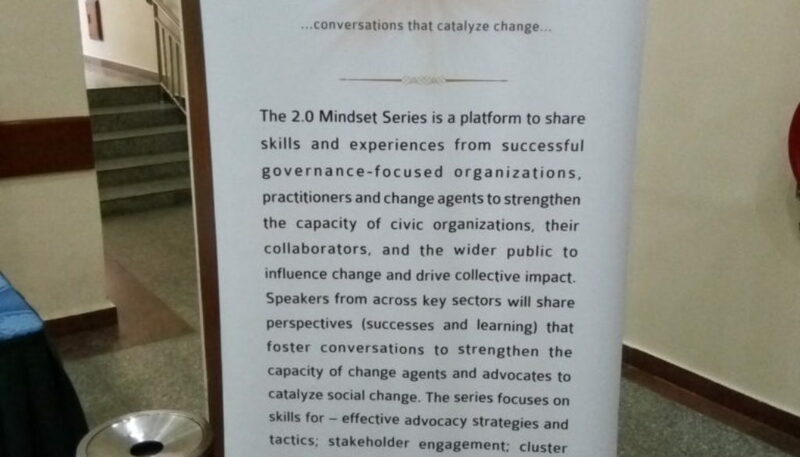 As part of the Objectives of the 2.0 Mindset series which is to share lessons learned based on the achievements and challenges of CSOs in TAGG engagement. Mariam Uwais, Special adviser to the President on Social Protection plan made cases for how we can effectively manage some social vices and curb them, in line with focus. She was quick to relay to the audience that “persistence has reward”. Mariam Uwais, Special adviser to the President on Social Protection plan made cases for how we can effectively manage some social menace and able to curb them, in line with focus, she was quick to relay to the audience that “persistence has its own reward”. The seasoned lawyer and activist also tasked the audience that in carrying out the functions, we must “be kind, be compassionate, put yourself in the others shoes and always keep the bigger picture in view”. Moreso , as the program also seek to provide an opportunity for key stakeholders to have in-depth discussion on the expectations and way forward in optimizing CSOs role in policy dialogue and reform. She enthused that “We’re enlisting 3rd party monitors to track social investment because it’s important to hear the other party’s’ voice. “Every beneficiary of social protection program of the Federal Government has BVN and their names in register” she added. Also as this initiative seeks to complement the project’s subsequent dialogues on fostering and strengthening public discourse and support for key democratic governance issues, e hope to , continue the conversation via http://ifollowthemoney.org and be part of the people that will drag positive change into the country. Do join us!